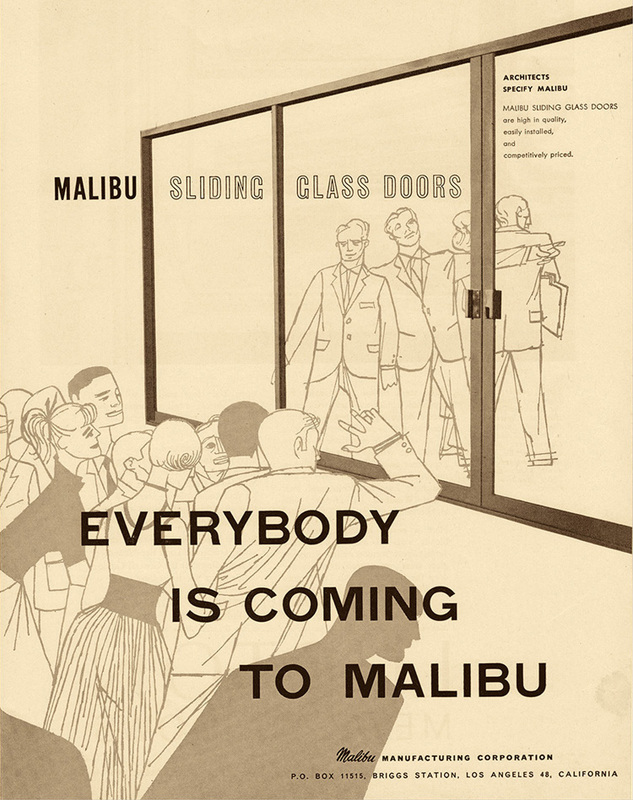 Two print ads that appeared in architectural trade journals in 1953 by Southern California-based sliding door companies Malibu (top) and Miller Manufacturing (above). As author and editor of Houseplans.com, Dan Gregory, noted in his blog 'Eye on Design,' "The first examples [of sliding glass doors] were usually custom-designed and became key features of modern houses, capturing the new machine-age spirit of the early 20th century." In the early boom years for modern residential architecture in California, right after the war, architects did whatever it took to create open-to-nature window walls. It wasn't easy. Glass louvers, and walls of fixed glass with smaller sections that could open were among the early solutions. 'Window walls,' like one designed by Harwell Harris for a Los Angeles home, often used large wood-frame doors that either swung open, or that slid open on tracks. A house near Danville designed in 1951 by architects Anshen and Allen, who had recently started working for Eichler, used wood-framed glass doors that swung open in a traditional manner as a component of a window wall. Early Eichlers too used wood mullions to frame glass walls, with wood-framed glass doors that swung open. These can be seen in the subdivision of Sunnyvale Manor from 1949 to 1950, for example, and in an early custom Eichler on the Stanford campus. Raymond Neutra believes his father played a role in the popularization of sliding doors. "My dad is the person who kept publicizing this device as something important," he says. "I'm pretty sure he was one of the main architects who asked manufacturers to fabricate these doors." Raymond's brother, architect Dion Neutra, who worked with his father, says, "He certainly used [a sliding door] in almost every design, and took advantage of every refinement imaginable. The Arcadia rep who used to call on us turned out to be none other than Elaine Jones, who became the wife of Quincy, much later." 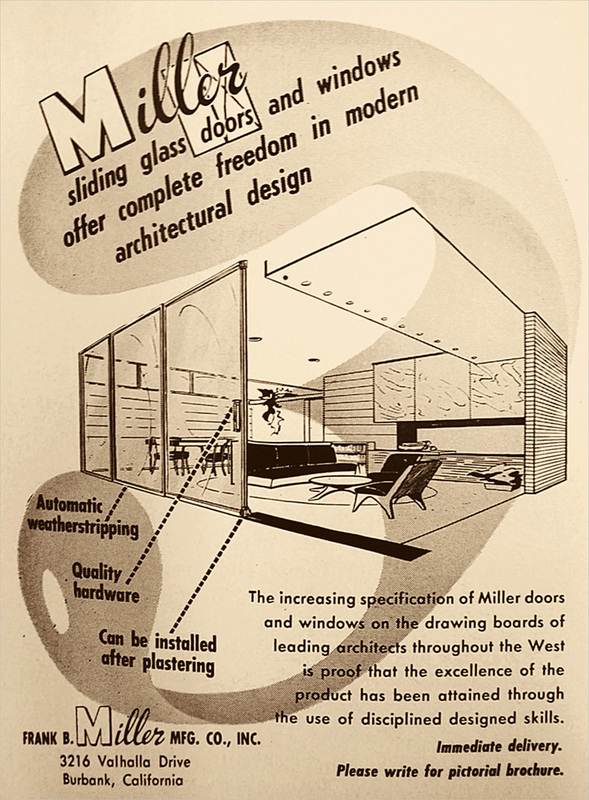 Several innovations increased the usability, and eventual popularity, of sliding glass doors. Raymond Neutra emphasizes the development of the bottom roller, for which the mechanism for movement is at the bottom of the door. "Up until the mid-1940s," he says, "metal and sliding glass doors were hung from barn door-like wheels and tracks. Then, between 1945 and 1950, doors with rollers in the bottom frame came on the market. These doors had very thin frames and changed the look of modern houses." "With a bottom roller you don't have the need for such heavy beams to hold the door in [place]," he says, adding, "It led to a more reliable product."